Check out our review of Nokia Lumia 925 smart phone. 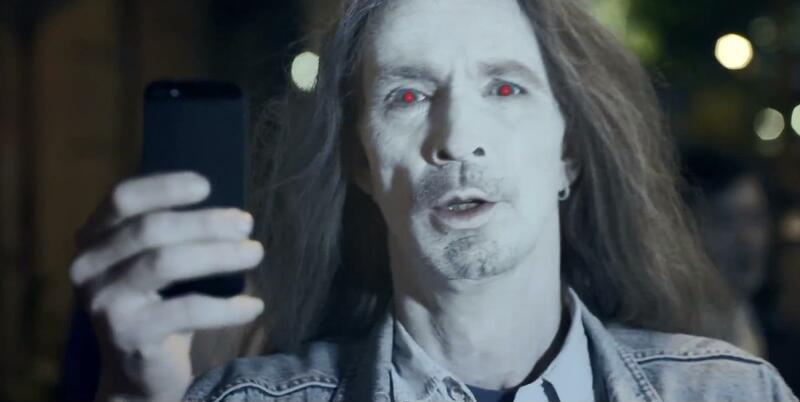 Published on YouTube yesterday and possibly running on broadcast television overseas, Nokia’s new commercial advertisement for the Lumia 925 pokes fun at the quality of low-light photos produced by the iPhone 5. Kicking off the commercial like most zombie flicks, the viewer sees a lone man walking the streets at night as ominous music starts to kick in. As he traversed the city at night, he comes across an endless number of zombie-like creatures with overexposed skin and glowing red eyes. Of course, transformation is attributed to the back-facing LED flash on Apple’s iPhone 5. The protagonist of the clip continues to become more frightened until one Apple user hold up their iPhone 5 to take a photo of the man. The viewer is led to believe that the victim of the photo will also turn into one of the freakish creatures wandering the city streets. At the end of the commercial, the phrase “The best pictures in any light. Even without the flash. The new Nokia Lumia 925,” flashes up on the screen. Oddly enough, Nokia doesn’t even bother to show the Lumia 925 more than a couple seconds within the commercial. In fact, the iPhone 5 gets more screen time than the Lumia 925. Beyond the addition of the commercial on YouTube, Nokia hasn’t mentioned the ad on social media channels or on the company’s official blog. However, the advertisement was created for Nokia Deutschland rather than the North American branch of Nokia. Powered by Windows Phone 8, the Lumia 925 was launched by Nokia last month with a 4.5-inch AMOLED display and 8.7-megapixel rear-facing camera. It’s clear that Nokia is attempting to pull in a segment of smartphone users that are unhappy with the photo quality, specifically shots taken at night. Beyond the Nokia 925, rumors are swirling around the July 11 announcement related to the Nokia EOS. Opting for a zoom lens for the smartphone’s rear-facing camera, the EOS will offer a Carl Zeiss lens and potentially the 40+ megapixels seen in the Nokia 808 Pureview.